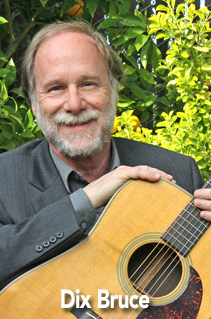 Dix Bruce is a musician and writer who has performed and recorded music in the San Francisco Bay Area since the mid-1970s. He is well-known in jazz and bluegrass music circles for his work with a variety of bands from bluecrass and country to jazz and bib band. He has recorded four duo CDs with guitarist Jim Nunally. For several years Dix was a clinician for the C.F. Martin Guitar Company conducting guitar clinics up and down the West coast. Dix also does studio work on guitar, mandolin, bass, and banjo, and has recorded two LPs with mandolin legend Frank Wakefield. Dix has produced over fifty music books and DVDs. 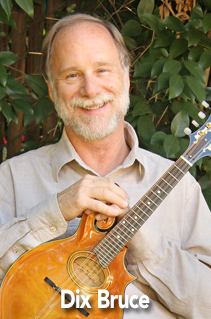 His latest publications are four book/CD sets for mandolin and guitar entitled “Gypsy Swing & Hot Club Rhythm” and “The Parking Lot Picker’s Songbooks.” Dix wrote and recorded music for three versions of the best-selling video game “The Sims.” He has taught at the Puget Sound Guitar Workshop, The California Coast Music Camp, Greater Yellowstone Music Camp, Camp Bluegrass, California Bluegrass Assn. Music Camp, Walker Creek Music Camp, and the American River Music Camp. His recent book/ CD sets are entitled, All Time Favorite Parking Lot Picker’s Mandolin Solos, Old Time Gospel Crosspicking Guitar Solos, and Christmas Cross Picking Solos for Guitar.